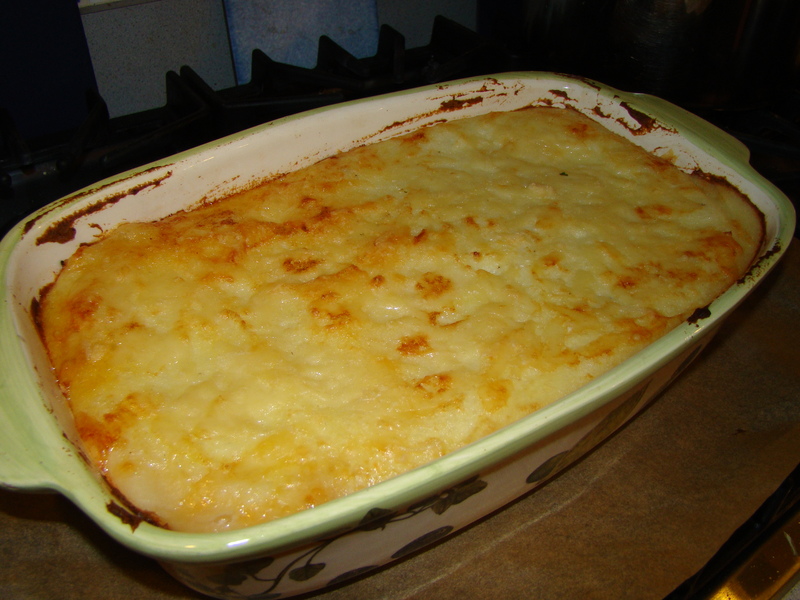 Hachis Parmentier is the French version of Shepherd’s Pie. It’s a meat mixture topped with mashed potatoes and baked. I made this last week because I got the recipes mixed up. It doesn’t really matter when I made it though. It was a big hit… Howard gave it 5 forks out of 5. I think it’s my favorite recipe that I’ve made so far from Around My French Table. 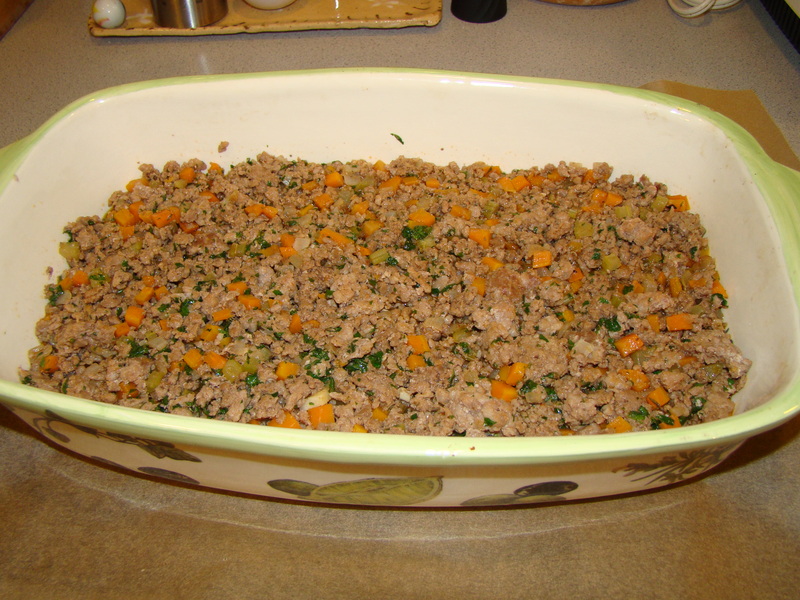 I made the Quick Hachis Parmentier from the Bonne Idee in the sidebar. The main reason is that we mainly eat from our meat CSA (read this post about our recent visit to Chestnut Farms), so what I have available is based on what’s in the freezer. I had plenty of delicious ground beef and hot Italian sausage, but no beef chuck, so I went with the quicker recipe. I know that Dorie explained that this recipe traditionally doesn’t have any vegetables, I felt like I needed some. Instead of the suggested garlic, I diced a carrot, a stalk of celery, and an onion (the vegetables in the bouillion recipe) and sautéed them in the skillet before adding the ground beef. I went a little heavy on the tomato paste because I had frozen the rest of the last can I opened in tablespoon-sized scoops, so I added one of those. Along with a generous handful of chopped fresh parsley, I also sprinkled the meat mixture with some dried thyme for good measure. The potatoes were a revelation. At our house, we prefer our mashed potatoes lumpy rather than smooth. 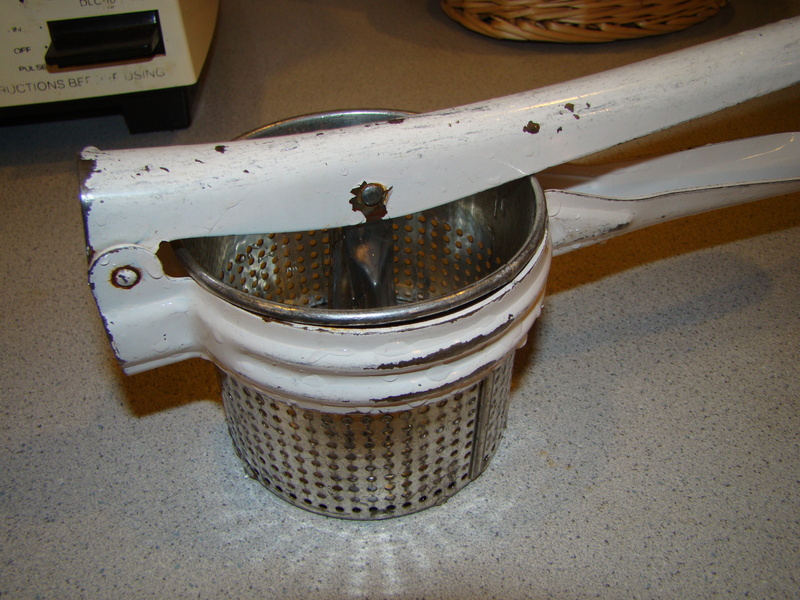 My usual tool is an old-fashioned potato masher, however, being a hoarder of kitchen gadgets, I did have a potato ricer on hand. I’d never used it before. It was Howard’s Aunt Sarah’s, and I’m sure it’s older than me. It was cool how the potatoes looked like rice as I pressed them through the ricer. The tool is aptly named. I didn’t have cream or whole milk, but I did have half-and-half and 2% milk. Half-and-half is half cream and half milk, after all, so I used the half-and-half for all the cream and half the milk, and then used only half the milk. The potatoes were so smooth and creamy. The trip through the ricer changed the texture completely from my usual lumps. While I won’t give up lumpy mashed potatoes for everyday, this way of making smooth ones is worth repeating for a special-occasion side dish. For the topping, I used Gruyere and the Parmesan. I baked it an extra five minutes or so to get the top brown enough. One more thing… The recipe says it makes 4 generous servings. I don’t think I could have eaten one quarter of the dish in one sitting. We actually had it for four different meals, so that’s more like 8 servings.